If you’re after a very special holiday in the tropical Caribbean that you will never forget, look no further than the beautiful island of St Lucia! It is literally a postcard perfect destination… think endless sandy white beaches, dense luscious rainforests and a tremendously scenic backdrop of mountain ranges. Sounds too good to be true, doesn’t it? Well it isn’t, St Lucia really does exist and we are eager to transport you there! Have a look at our cheap offers and you won’t be able to resist! To experience some beautiful Caribbean sunshine, it’s best to visit St Lucia through the dry season, which sits between the months of December and March. In this period, temperatures reach a high of 27 degrees. However, even between June and November, which are the rainy months, St Lucia still generally experiences hours of sunshine daily. The showers of rain also tend to be very short and still warm! You could snap up a truly fantastic bargain holiday in the rainy season so have a look at our cheap offers now! If you’re a lover of nature, it is definitely worth taking a trip to St Lucia between March to August as this is when turtles come ashore and nest on the beaches. Fancy a bit of an adventure? When imagining St Lucia, relaxing on a beautiful beach with the gorgeous shining sun is generally what people think of, however there is also lots of adventure to be pursued on this idyllic island. 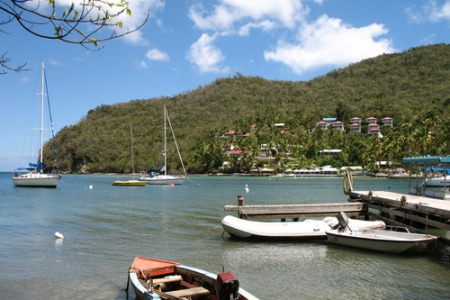 For a touch of adventure, St Lucia offers mountain biking, windsurfing, trekking and horse riding! Or should you want to really explore the small island, there are rainforests just begging to be visited. You could hike or even bike through the dense rainforest trails. If you don’t want to venture far from the beach, perhaps scuba diving amongst the colourful coral reefs will appeal to you. An absolute must visit is a beautiful natural wonder, the famous Soufriere volcano. You can see the amazing rocky landscape, which oozes boiling hot bubbling mud and sulphur. Or maybe a trip to the botanical gardens where you can see the breathtaking Diamond Waterfall takes your fancy. It is here where the sulphur infused water makes it change colour so if you go there for a day trip you may see the colour change from yellow to green to black! This is a must see for any nature enthusiasts! St Lucia has evening entertainment to please every holidaymaker. If you want a relaxing evening, simply enjoy the local cuisine from the many bars and restaurants scattered along the seafront, all which exert the laidback, chilled Caribbean atmosphere. Or if you’d prefer something a little more active on an evening, you must visit Gros Islet and Ansa la Raye where bustling street parties full of reggae music and dancing take over every Friday. A holiday in St Lucia is a holiday in heaven. So what are you waiting for? Have a look at our low cost offers to St Lucia and you could soon be doing as much or as little as you like in this Caribbean paradise!